Eu como legumes pra chuchu. E você? = I eat a lot of vegetables. And you? Pra chuchu is a Brazilian Portuguese street smart expression that means “a lot”, “very”. It is said that the expression was created because chayote grows abundantly almost anywhere in Brazil. Estudei pra chuchu para o teste de Português = I studied a lot for the Portuguese quiz. Tinha gente pra chuchu na festa. = There was a lot of people at the party. A festa foi boa pra chuchu! = The party was very good. Gasolina é cara pra chuchu em São Francisco = Gas is very expensive in San Francisco. Chayote can be found all over Brazil. It is rich in fibers and low in calories, and has diuretic and anti-inflammatory properties. I remember my grandma’s tea recipe using chuchu: Infuse the chayote leaves or the fruit for a few minutes and drink it. She believed that it could help in the treatment of high blood pressure and kidney stones. Please have in mind that I am only sharing a family tea recipe, and this is not a medical advice. 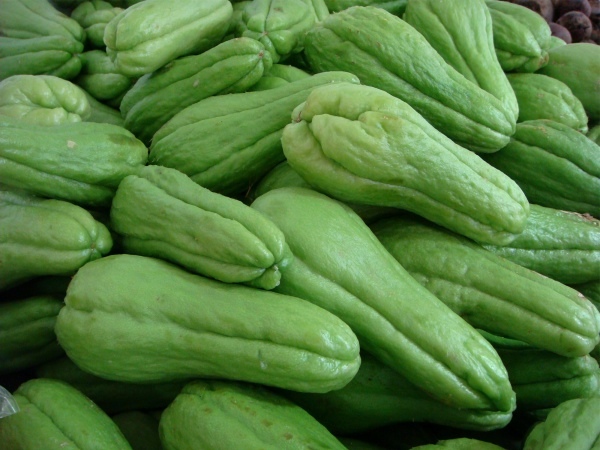 Although chayote is a fruit, it is mostly used as a vegetable in Brazilian cuisine. It’s a key ingredient in many hot salads, soups, and soufflés. For a recipe of chayote soufflé click here. To learn the vocabulary of other vegetables and grains that are part of the Brazilian cuisine, check out the new set of flashcards below. I hope you like it pra chuchu! Tip to use these flashcards: To see the English word on one side and the Portuguese translation on the other, disable (uncheck) “Both Sides” on the top right of the cards. Click to flip the card.